Today I have a very special blog post! I'm so excited to tell you that Mr. P of Delicious Delicious Delicious has asked me to be a judge of his "Reinventing the Lamington" bake off! Mr. P has a wonderful blog and he made a Bundt during my "I Like Big Bundts" marathon. Peter made 10 different lamingtons leading up to Australia Day. The Lamington is an Australian square treat of sponge cake sandwiched with cream or jam, dipped in chocolate, and covered with coconut! Get that? It has something for everyone! But did Mr. P want people to make just a regular lamington? Oh no, he wanted people to get creative and reinvent this treat. And, holy smokes, the contestants did a great job at that! It was so difficult to choose my top three favorites! All the entries were so inventive, bold, and just plain reach-in-the-computer and grab one yummy looking! Everyone really took the lamington to a new level. Bravo everyone on a great job!! I have something to admit so we have full disclosure here. I’ve never had a lamington...because I’m one of those people. Those coconut haters. I like the flavor of coconut, but strands, dessicated or slices of coconut send me running for the hills. But I know I would eat all the lamingtons in this contest (well, some with the coconut scraped off). Please note that I didn’t let my non-love of the coconut affect my judging in any way. You have to read his full entry to hear the fantastic story behind these spherical lamingtons. 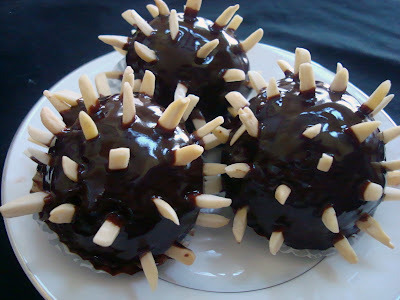 So very creative in approach and the taste sounds delightful: chocolate nut sponge cake, filled with raspberry jam, coated with apriot jam, covered with chocolate and studded with sliced almonds! O Canada Lamingtons by For Goodness Cake! Nothing like a Canadian baking an Austrian treat for a English guy's blog. Ain't the interwebs grand that it pulls us all together like that? This lamington combines all things Canadian in a yummy package. The middle is filled with candied bacon buttercream and is surrounded by a maple glaze. Serious deliciousness! This college student is amazing! She finds time to bake up a lamington and study! 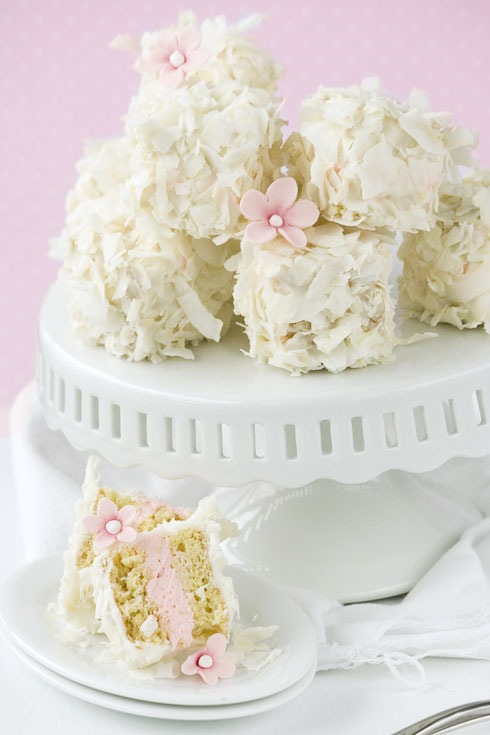 What a lovely shade of girly pink fill this lamington. A bit of maraschino cherry juice is infused in the buttercream, making it light and pretty. Some people don't like the maraschino cherry, but I think this little touch would make a delicious filling. Again, great job everyone on your ingenious reinvented lamingtons! I enjoyed being a judge and discovering so many wonderful bloggers. Be sure to check out Delicious Delicious Delicious to see the great round up of entries! Find out who won this year's competition on Mr. P's blog! Well, you've had three Lamingtons before I even knew such a thing existed. They look great! Great contest....so fun...I never knew what a lamington was before today! Thank you very much for choosing my entry, I feel so honoured! Aw, thank you for choosing my entry! Oh my goodness, where have these things been all my life?? I guess in Australia. :-) Wow, I'm very intrigued - snack size layer cake sounds fabulous to me! Thanks so much Mary! You know what a relief it is to know that I don't have to pick the winner myself? A big one. You're killing me with the idea of self frosting Nutella cupcakes by the way. Want some. Congrats Mary on being asked to be a judge! That's fantastic... Gotta' say I'm loving the first one...looks like something (yummy) from outer space!